An extremely low lint, pre-cleaning automotive wipe with incredile strength even when wet. It is perfect for demanding tasks, such as dealing with solvents and spirits, and has superb absorbtion with water and oils. Roll Size: 230mm x 140m. Sheet Size: 23cm x 40cm. Quantity: 350 sheets per roll. Automax 6 is an extremely low lint pre-cleaning cloth with superior strength even when wet. It is perfect for demanding tasks including dealing with solvents and spirits and has superb absorption with water and oils. This product has been developed to meet the specialist requirements of the body shop, as well as cater for the needs of most end users in many different environments. 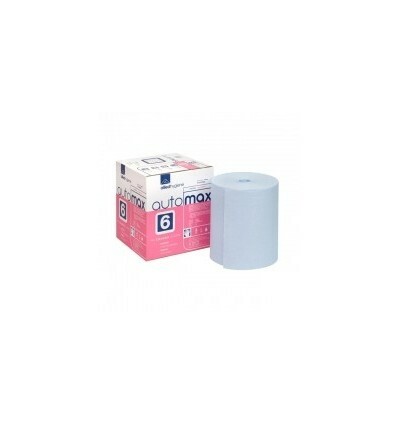 Automax 6 is a boxed wipe which protects the roll against contamination. The roll end exits through an aperture in the top of the box, reducing over use. Designed for Automotive & Refinishing, Engineering, General Housekeeping, Agriculture, Aerospace, Transport, Catering and Food Manufacture and Double Glazing Industries.